As all good health coaches know, real, sustainable health changes do not come from a weeklong diet or a few trips to the gym. To achieve lasting results, you have to start looking at health and wellness from a complete and total perspective. When you do this, you’ll likely see that there is no quick solution to a healthy life and that your overall health is actually a combination of your diet, exercise, lifestyle, and attitude. At Balanced Wellness we take pride in providing the type of health and wellness services that make a difference in the lives of our participants. From incentive programs to health workshops and weight loss management, we offer a range of programs that are all aimed at helping individuals achieve their optimal well-being. 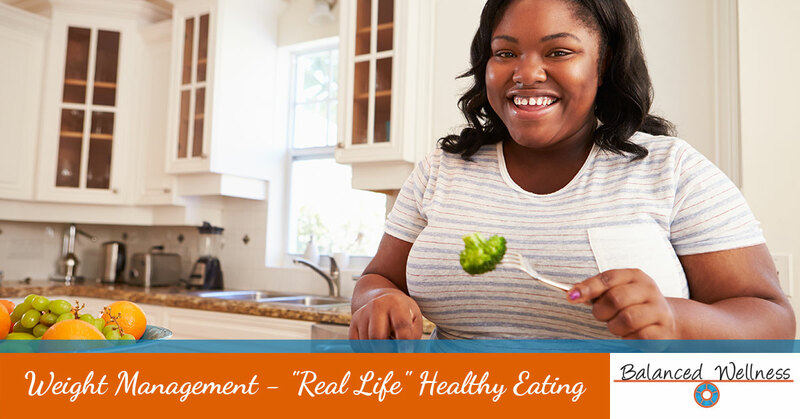 Read on to learn about one of our key Weight Management Programs: “Real Life” Healthy Eating. All big changes start with a solid plan—a plan that is realistic, tailored toward individual needs and has a framework that is big-picture focused, yet driven by small, achievable benchmarks. Similar to our other programs, the “Real Life” Healthy Eating Program begins with this type of planning. We first get to know our participants—their vision, goals, roadblocks, preferences, etc.—and then use this information to set weekly goals that are directed at breaking bad habits and replacing them with good, healthy habits. Progress takes time. It is achieved one step, one day at a time. When you approach weight loss with a macro focus, you can easily get overwhelmed, which can derail your larger initiative. This is why our weight management program includes small goals that are used to expand total wellness understanding and address common challenges that participants face during certain periods in their weight loss program. For example, at the four-week mark, you might be asked reexamine and “ReSet” your strategy—because typically this is the point in the diet when you begin to plateau and feel like you’re stuck in a hamster wheel of dieting. To resolve this feeling, we have a session dedicated specifically to the goal of jumping out of the dieting mindset and jump into the lifestyle-change mindset. Similarly, at the week-seven mark, your schedule may include a workshop that will help you detect when fats are hidden in foods and how to manage the situation through smart substitutions. The idea is that after this week participants will not only leave feeling more confident in their ability to understand and interpret nutrition labels but also gain a more critical outlook on their personal health and food consumption—which, as we’ve surely mentioned before, is vital to achieving optimal wellness. While some people learn from watching, others may learn from doing or reading. The point is: everyone learns differently. At Balanced Wellness, we understand this, and we use this understanding to inform how we educate the participants of our Weight Management Program. Utilizing an array of methods and resources—articles, videos, worksheets, and interactive tools—we strive to provide a comprehensive education that works for all. If you’ve never given your diet too much thought, then you probably aren’t entirely confident what’s nutritious and what’s not. The best way to truly learn about nutrition is by referencing trusted resources, preparing and eating healthy meals, and sharing health knowledge and tips with others. This is a big component of our weight loss program, and we have even dedicated an entire segment of our weight management plan to sharing recipes and successes with other participants. Additionally, the “Real Life” Healthy Eating Program also includes nutrition references, shopping lists, interactive tools, and meal planners. By interacting with these resources, users are able to see the calorie amount for each item and develop a better, more well-rounded understanding of nutrition. In short, each component of our weight loss program is designed to enhance your understanding of your personal health and wellness. The health coaches at Balanced Wellness strive to expose you to all aspects of health and wellness, build a network of other supportive participants, and help you become your best self. We also offer wellness coaching as a stand-alone service. Contact us for more information!